Career day traders use a risk-management method called the 1 percent risk rule, or vary it slightly to fit their trading methods. Adherence to the rule keeps capital losses to a minimum when a trader has an off day or experiences tough market conditions, while still allowing for great monthly returns or income. The 1 percent risk rule makes sense for many reasons, and you can benefit from understanding and using it as part of your trading strategy. Following the rule means you never risk more than 1 percent of your account value on a single trade. That doesn’t mean that if you have a $30,000 trading account you can only buy $300 worth of stock, which would be 1 percent of $30,000. You can use all of your capital on a single trade, or even more if you utilize leverage. Implementing the 1 percent risk rule means you take risk management steps so that you prevent losses of more than 1 percent on any single trade. No one wins every trade, and the 1 percent risk rule helps protect a trader’s capital from declining significantly in unfavorable situations. If you risk 1 percent of your current account balance on each trade, you would need to lose 100 trades in a row to wipe out your account. If novice traders followed the 1 percent rule, many more of them would make it successfully through their first trading year. Risking 1 percent or less per trade may seem like a small amount to some people, yet it can still provide great returns. If you risk 1 percent, you should also set your profit goal or expectation on each successful trade to 1.5 percent to 2 percent or more. When making several trades a day, gaining a few percentage points on your account each day is quite possible, even if you only win half of your trades. By risking 1 percent of your own account on a single trade, you can make a trade which gives you a 2- percent return on your account, even though the market only moved a fraction of a percent. Similarly, you can risk 1 percent of your account even if the price typically moves 5 percent or 0.5 percent. You can achieve this by using targets and stop loss orders. You can use the rule to day trade stocks or other markets such as futures or forex. Assume you want to buy a stock at $15, and you have a $30,000 account. You look at the chart and see the price recently put in a short-term swing low at $14.90. You place a stop loss order at $14.89, one cent below the recent low price. For more on this, see Where to Place a Stop Loss. Now that you know your stop loss location, you can calculate how many shares to buy while risking no more than 1 percent of your account. 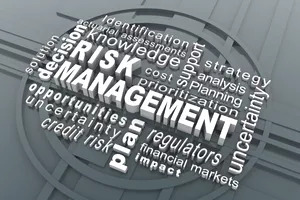 Your account risk equates to 1 percent of $30,000, or $300. Your trade risk equals $0.11, calculated as the difference between your stock buy price and stop loss price. Divide your account risk by your trade risk to get the proper position size: $300 / $0.11 = 2,727 shares. Round this down to 2,700, and this shows how many shares you can buy in this trade without exposing yourself to losses of more than 1 percent of your account. Note that 2,700 shares at $15 costs $40,500, which exceeds the value of your $30,000 account balance. Therefore, you need leverage of at least 2:1 to make this trade. If the stock price hits your stop loss, you will lose about 1 percent of your capital or close to $300 in this case. But if the price moves higher and you sell your shares at $15.22, you make almost 2 percent on your money, or close to $600 (less commissions). This is because your position is calibrated to make or lose almost 1 percent for each $0.11 the price moves. If you exit at $15.33 you make almost 3 percent on the trade, even though the price only moved about 2 percent. This method allows you to adapt trades to all types of market conditions, whether volatile or sedate, and still make money. The method also applies to all markets. Before trading be aware of slippage where you’re unable to get out at the stop loss price and could take a bigger loss than expected. Traders with trading accounts of less than $100,000 commonly use the 1 percent rule. While 1 percent offers more safety, once you’re consistently profitable some traders use a 2 percent risk rule, risking 2 percent of their account value per trade. A middle ground would be only risking 1.5 percent or any other percentage below 2 percent. For accounts over $100,000, many traders risk less than 1 percent. For example, they may risk as little as 0.5 percent or even 0.1 percent on a large account. While short-term trading, it becomes difficult to risk even 1 percent because the position sizes get so big. Each trader finds a percentage they feel comfortable with and that suits the liquidity of the market in which they trade. Whichever percentage you choose, keep it below 2 percent. The 1 percent rule can be tweaked to suit each individual trader’s account size and market. Set a percentage you feel comfortable risking, and then calculate your position size for each trade according to the entry price and stop loss. Following the 1 percent rule means you can withstand a long string of losses. Assuming you have larger winning trades than losers, you’ll find your capital doesn’t drop very quickly but can rise rather quickly. Before risking any money, even 1 percent, practice your strategy in a demo account and work ​to make consistent profits before investing your actual capital.